We oftentimes associate romantic weekends with warm weather and long walks on the beach… Which, don’t get us wrong - we love a good tropical destination — but romance is not dead in cold weather, either! There is something extremely romantic about cozying up by a fire and drinking mulled wine, watching the snow fall, and swimming in a heated pool surrounded by snowy white mountains. We just got back from a dreamy weekend in Sun Valley, Idaho, and folks - it was everything these lovebirds could have wanted… and so much more! Here’s a few of our “must-do’s” the next time you bring your Boo to Sun Valley! If you’re staying at the Sun Valley Lodge, you have got to watch the sunrise in their pool. This requires waking up early, but it’s so worth it. (You could probably watch the sunset instead, but you might not be the only ones in the pool. It’s super romantic to have the place to yourselves!) Heated at a toasty 98 degrees (the boy band would be so proud) it’s the perfect temperature to enjoy when the weather is freezing. It snowed one morning when we were in the pool and we LOVED it!! The steam that radiates from the pool is captivating - especially as the sun rises and the sky lights up. Grab a coffee from the lobby on your way, and brace yourself for the free show!! Whether it's ice-skating, snowshoeing, or skiing, there are plenty of wintery activities that we California kids don't get too much of. Since Sun Valley was uncharacteristically low on snow during this trip, skiing was our best option. Luckily, neither of us had EVER done it (Bobby grew up snowboarding, but Alli was a total newbie). If you're brand new like us, we recommend heading to Dollar Mountain and signing up for the SunStart lesson. We had an incredible instructor (Hi Steve!) that gave us both the best possible experience! We can only imagine that if we were doing it on our own we may have gotten into an argument or two... skiing is tough! But back to the point, it can also be romantic (hehe). Nothing says "I love you" like persevering through a new adventure together, and earning the cocktails you'll be cheers-ing later that day! You read that right - bowling!! 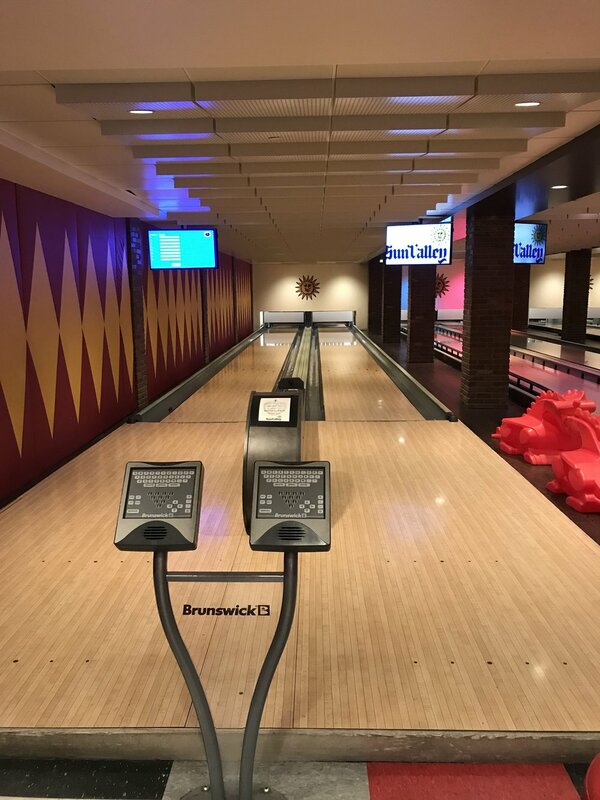 Located in the basement of the Sun Valley Lodge is one of the coolest bowling alleys we’ve been to yet - and it’s a great activity when you want a break from the cold! We spent an afternoon down there playing a couple of games (we’re both terrible), having a few drinks, and paused to eat some nachos in between! It ended up being one of our favorite memories from the trip! Cue the violins and Celine Dion, this is hands down the most romantic date night we’ve had in awhile. 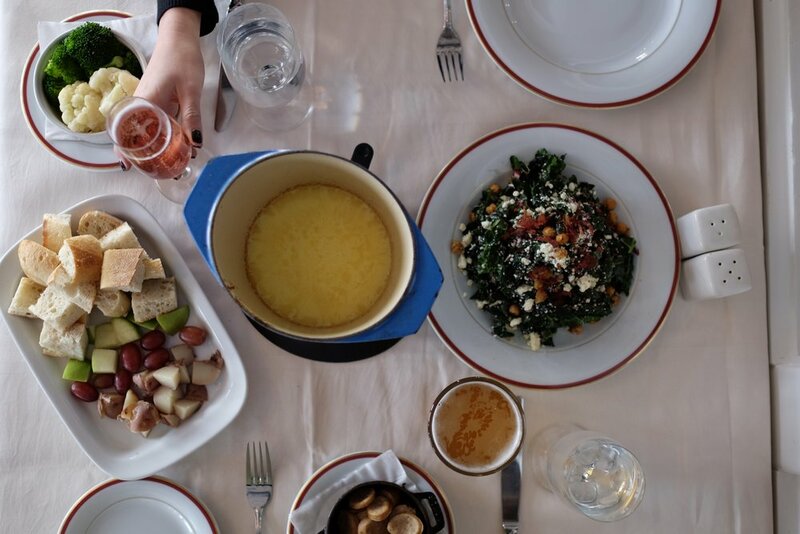 Sun Valley offers visitors the opportunity to take a horse-drawn sleigh to an amazing 3 course dinner at the historic Trail Creek Cabin. Unfortunately the snow wasn’t thick enough to take a sleigh, so we were on a horse-drawn wagon, but it didn’t even matter. It was AWESOME. We cuddled up in blankets and rode under a star-studded sky to dinner. The cabin was warm and cozy, and the food was SO good. (Highly recommend the huckleberry ice cream sundae!) Everything about this night felt like a dream… or a Hallmark Christmas movie. It’s a date night for the books! Lastly, you can’t head to Sun Valley for a romantic weekend without spending time at the spa!! The Sun Valley Lodge has a newly-remolded spa that is one of the best we’ve seen. It’s spacious, luxurious, and has some of the coolest showers we’ve ever experienced. (Not kidding - make sure you do the “Experience Shower” while you’re there!) Nothing says “romance” like a couples massage… especially after a day of skiing! Newer PostVisit Sun Valley! A Weekend Winter Wonderland!